Note that NetRadiant would automatically create a category for two or more shader namespaces sharing a same prefix that ends in and underscore. Viech wrote: Special rules apply, I think CRN is not supported. I confirm, CRN is not supported for skyboxes. illwieckz wrote: Is there a table that list old entities names alongside new entities names to use instead ? Not yet, but you could parse it from this entities.yaml file (look for "deprecated: y"). Would be nice to have it on the wiki. Actually, a lot of people could profit from a whole page dedicated to porting maps from Tremulous to Unvanquished. It will merge the bsp with the fixed "entities" lump. Last edited by illwieckz on Wed Mar 04, 2015 12:49 am UTC, edited 2 times in total. About textures/common shaders, some maps rely on textures/common-trem only and others on both textures/common-trem and textures/common, the first is shipped by my tex-tremulous package, some maps ship the second one, others not. Do you think I can safely replace each textures/common-trem by textures/common, then add the tex-common dependency to each map? I've done the trick above and it seems to work. Do you have an idea wich I can use in Unvanquished's texture/common as placeholder? illwieckz wrote: About textures/common shaders, some maps rely on textures/common-trem only and others on both textures/common-trem and textures/common, the first is shipped by my tex-tremulous package, some maps ship the second one, others not. Yeah, all relevant common-trem shaders (in particular the no-build ones) are now in common. Changing the pathes in the pk3 and including tex-common as a dependency should work. textures/NULL could be a radiant default, try to replace it with textures/common/caulk. I still have no idea what textures/common/nolightmap is supposed to be good for. 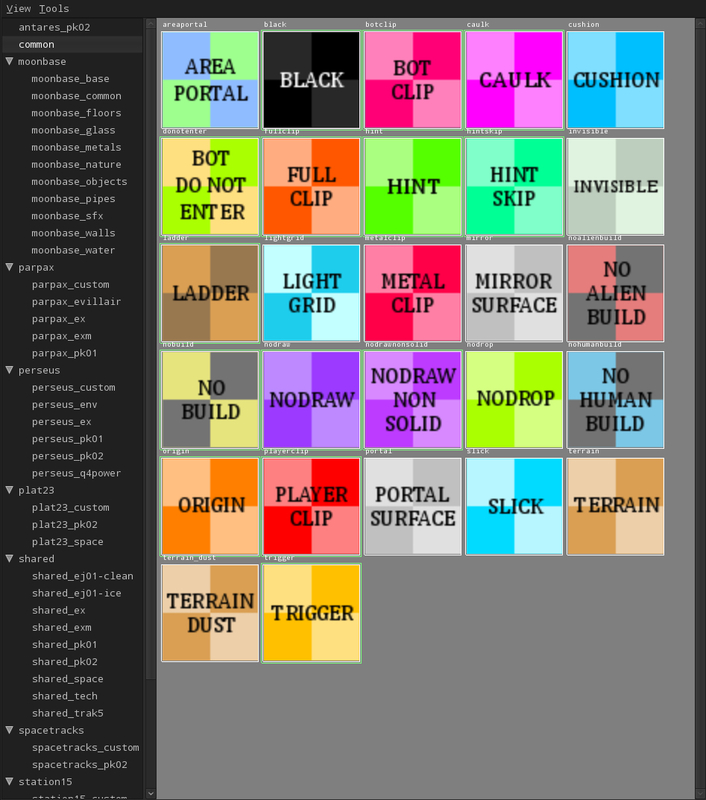 It was a shader that had only the nolightmap surfaceparm, so it's basically a shader with the only attribute that no light map is generated for it, which is like having a cooking receipt that only says that the thing you're supposed to cook doesn't contain onions… Try to replace it with textures/common/nodrawnonsolid which is basically an invisible, non-clipping wall that doesn't cast shadows. I think group is supposed to be an attribute key, not part of an entity name. Thus grep group_ won't cut it, remove the underscore.